Lily (Lilium) bulbs multiply continuously, hidden under the soil. Each spring, new flowers come up reliably, even if you neglected them through the year. But, every few years, lilies need to be divided and transplanted, otherwise they get overcrowded, resulting in fewer flowers and weak plant growth. Lilies grow in U.S. Department of Agriculture plant hardiness zones 4 through 8. Lilies thrive in cool climates where winter naturally chills the bulbs. 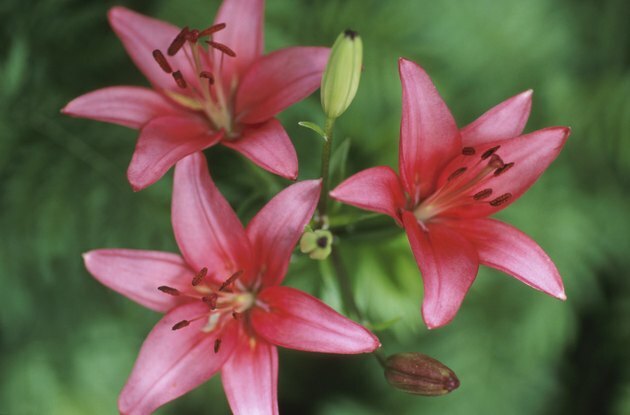 When growing lilies, it's best to let them grow undisturbed as long as they are flowering reliably. In general, plan to divide lilies about every three years, or when when you notice an overall reduction in flowers and spindly weak-looking stems. Lily bulbs produce small offsets that grow into full-size bulbs. As the bulbs multiply, it causes overcrowding in the growing area. Plan to separate and transplant lilies in early fall, after the flowers fade and the leaves start to die back. Use a garden fork to dig under the bulbs and lift them from the soil. Lily bulbs grow right below the leaf stalk, so you can dig 3 to 6-inches from the edge of the clump without damaging the main bulbs. Shake of the excess soil to expose the bulbs. Gently pull the clump apart to expose the individual bulbs. Use your fingers to untangle the roots. Hold the lily bulb and identify the smaller offset growing out from the side. They will be connected at the base. Gently break the smaller bulb from the larger bulb. Ideally you should replant immediately, but you can store lily bulbs until spring if replanting right away isn't convenient. To store, pack lily bulbs in damp peat moss and place them in a plastic bag. Keep the bulbs in the refrigerator until you are ready to plant. You can replant all the lily bulbs in the original spot spreading them out to avoid overcrowding, or move some to a new garden area. Lilies grow best in full sun and soil with good drainage. Dig holes for each bulb two to three times deeper than the height of the bulb. Place one lily bulb in each hole with the flat side down and the pointed side up. Push the soil over the bulb and pat it down gently. Space each lily bulb 12 to 18 inches apart. After you are finished planting, water the area.